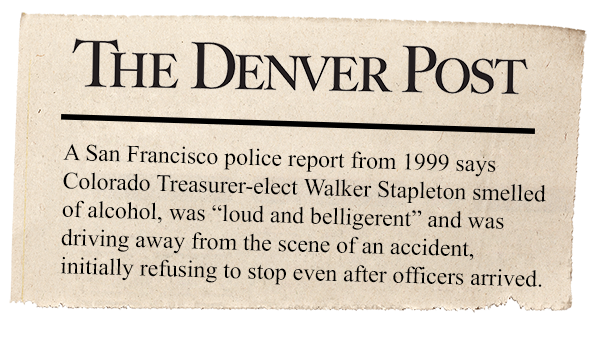 Just before the 2010 elections, a shocking report in the Denver Post detailed an alleged hit-and-run accident committed by Walker Stapleton, who later pled guilty to DUI. Stapleton is alleged to have caused bodily injury to two pedestrians while under the influence of alcohol, then attempting to leave the scene before authorities could arrive. When the story broke in 2010, it was too late to change the outcome of the election. Stapleton’s campaign promised to release all records related to this incident. Nearly eight years later, we’re still waiting. Walker Stapleton is running for governor of Colorado. Stapleton’s Republican opponents in the gubernatorial race have raised hard questions about Stapleton’s alleged hit-and-run. Stapleton has refused to cooperate, claiming back in 2010 that “we’re trying to figure out how much it’s going to cost to get all of this.” Stapleton raised a million dollars to hire petition gatherers for his campaign with criminal records this year. Now there’s no money to release the truth about his own criminal record? Fine. We’ll take care of it. Click here to throw in $25 to help ProgressNow Colorado cover any costs of obtaining Walker Stapleton’s criminal records. Stapleton has tried to cover up this crime for almost two decades. After he managed to get elected Treasurer in 2010, Stapleton thought he would be able to live down his criminal record. But anyone running for the highest elected office in Colorado should know better. The people of Colorado, regardless of party, need to be able to trust in the integrity of our public officials. Help us make sure no voter in Colorado casts a ballot without knowing the truth about Walker Stapleton’s criminal record. Make a donation now. Thanks for helping us hold the powerful accountable.